He roars up to the courtyard of The Puli Hotel in Jing’an; a guy with hipster beard and jeans astride a shiny black vintage motorbike with sidecar. His bike has been part of Chinese history for a lot longer than the glossy limos it parks alongside. Loved by Hitler (the 1938 BMW R71 was the prototype) and Stalin, bikes like this were given to the Chinese military by the Soviets in 1957. In later years they found their way all over the Chinese countryside. I remember seeing one in Guilin many years ago loaded with rice and chickens. I climb in, don my vintage helmet and goggles and am immediately transformed into a female Biggles flying ace, chin-strap flapping as the bike roars into throaty life and ‘heads out on the highway’ - Changde Road. It is at this point I release just how much Shanghai has changed since these motorbikes ruled the bumpy roads, as electric scooters attack us like mosquitos and multiple lanes of traffic growl to a stop at the lights. Strangely - despite my nearness to the ground, the relative flimsiness of the side car and the fact that a large Maybach with tinted windows has just muscled by within an inch of my arm - I feel quite secure. Maybe because my guide, Arthur, knows Shanghai like the back of his bike-crazy hand. He’s lived here for many years and goes everywhere on 750cc’s. And that’s one of the best things about a bike tour with Insiders Experience, you get what you pay for – insiders. People who can take you to places traditional tour guides don’t even know about. They can of course take you to the main sights if that’s what you want because this is a completely tailor-made tour. Before we began my driver pulled out a copy of a map the same vintage as his bike -1930s Shanghai and we planned our excursion around my interests: architecture, old Shanghai and dumplings. In no time we’ve turned off the main drag and plunged into a warren of back streets on our way east. First stop is the Art Deco glory of the old Pei Mansion (the family of uber-architect I M Pei and Shanghai superstars in their day). It is now a boutique hotel on Nan Yang Road. It’s a glorious building full of 1930s memorabilia with a dragon staircase, painted ceilings and even a secret room where the family clerk used to count the money after high-flying deals were done. Shanghai is known for its Art Deco buildings, everybody knows The Fairmont Peace Hotel and the magnificent buildings along The Bund but my laid-back position in the sidecar means I’m compelled to look up and so I notice many more unrestored ‘Deco wonders along the route. Arthur shows me his favourite, boarded-up on Sechuan Rd and we both agree we’d love to have an apartment on one of its once-fancy floors. Through the dusty back streets we fly past tiny shops and wobbling cyclists to arrive at the 1933 complex an incredible Art Deco building that was once an abattoir, now transformed into a modern restaurant and shopping venue. The building is magnificent if macabre. Inside walkways and stairs criss-cross like an Escher lithograph. The Chinese think it has bad Feng Shui (the cattle would probably have agreed) so it isn’t exactly thriving but it is worth seeing. Also worth seeing are the fast-disappearing traditional laneways (Longtangs) which once made up 90 per cent of the cities homes, now being knocked down so fast that bricks lay everywhere like discarded Mahjong tiles. In most places families are being moved to slick new high-rises in Pudong, however in one of the remaining areas some people cling to community. We stop the bike and walk under washing strung like lanterns across the narrow alley and past a mother and child washing themselves in an outside faucet. On one wall is an old mural of Mao - a young M in blue robes, a copy of one of the most important painting of the Cultural Revolution - no one in China seems to want to protect this particular slice of history (for obvious reasons), still , it is sad that this too will disappear. We make our way back past local hardware and dumpling shops –“no, wait, stop” and along the side of Suzhou Creek; once a poor area but about to be gentrified with a new Bulgari hotel and retail space. A quick stop to admire The bund from afar and I am deposited back in Jing’an with its designer stores and glass and steel monuments to new Shanghai. Insiders Experience also explore Xi’an, and Sanya by vintage sidecar and Jeep. And the company has now branched out to Morocco, where founder, Thomas Chabrieres, now lives. 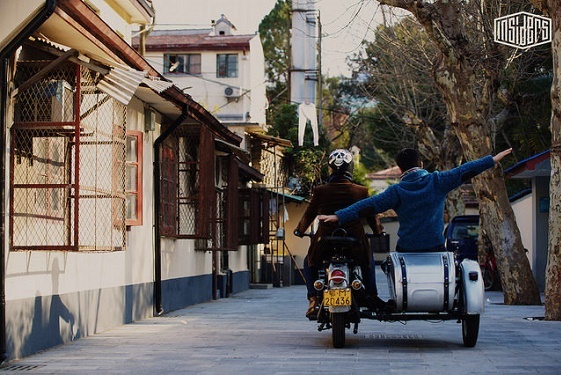 In Shanghai insiders offers one hour, two hour and four hour sidecar tours. And you’ll be glad to know that Carbon emissions are bought back with Action Carbone.